"Who are you to label revolutionary institutions as terrorists?" Rouhani asked in a speech broadcast live by state television. Speaking at a ceremony to mark Iran's national nuclear technology day in Tehran, Rouhani defended the Revolutionary Guards as a force that has fought terrorism ever since its creation in 1979. In contrast, the Islamic republic's president accused US forces of having always been directly or indirectly involved with terrorist groups or acts of terrorism. "You want to use terrorist groups as tools against the nations of the region... you are the leader of world terrorism. "Who is propagating and encouraging terrorism in today's world? Who wanted to use ISIS (the Islamic State group) as a tool?" Rouhani asked, saying that the US is harbouring the leaders of the jihadist organisation. "Even now America is hiding the heads of ISIS, even now they are not prepared to tell the regional governments where the heads of ISIS are hiding." Iran swiftly retaliated against the US move on Monday by calling US troops "terrorists". It is the first time that Washington has branded part of a foreign government a terrorist group, meaning that anyone who deals with the Islamic Revolutionary Guard Corps could face prison in the United States. 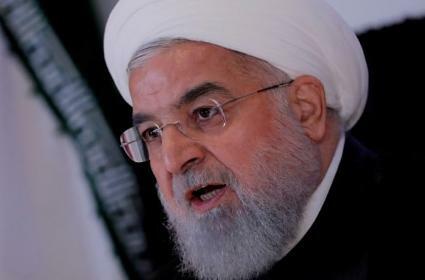 To support his accusations, Rouhani cited the downing of Iran Air Flight 655 in July 1988 by missiles fired from the US naval ship the USS Vincennes. "You have done everything imaginable. Which force was it that shot down our civil airliner in the waters of the Persian Gulf?" he said, adding that it was aimed at intimidating Iran. "You wanted to tell the Iranian nation that we do not have any red lines, you wanted to say that we also kill children, you wanted to say that we also kill women," Rouhani said, concluding that the US was transmitting "a message of terrorism in the whole world."